Beets come in a few different shapes and jewel-like colors. The most remarkable being the Chioggia beet with its red and white striped, or bulls-eye, cross section. 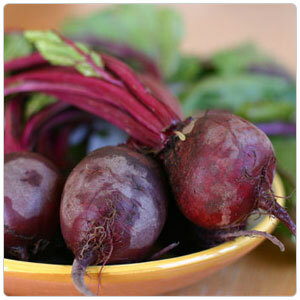 There are also gold, pink and white beets as well as the very common red beet. All beets have a very high sugar content. Chioggia beets are quite mild in flavor compared to the slightly bitter large red beet. Beets are commonly used in salads. Their greens are also quite tender and sweet and can be prepared similarly to spinach or chard. Beets can be roasted, boiled, steamed and served raw. Beets are native to the Mediterranean. Although the leaves have been eaten since before written history, the beet root was generally used medicinally and did not become a popular food until French chefs recognized their potential in the 1800's.